11 East 14th Street – Page 2 – Illustrated essays on motion pictures and the performing arts. Two dear friends, Mazie (Mary Pickford) and Nellie (Lottie Pickford), enjoy a mid-summer’s holiday at a country resort, admiring each other’s wardrobe and accessories. “Oh, My! How lovely you look today! That dress! Would you like to wear this necklace with it? 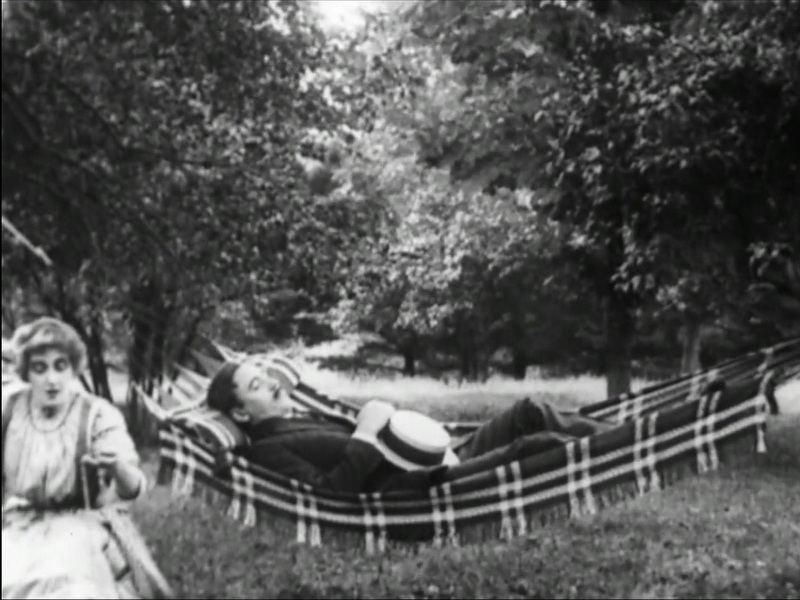 “Oh, yes!” But soon their idyllic weekend is turned inside out by a series of comical misunderstandings in A Gold Necklace (Biograph 1910, directed by Frank Powell). 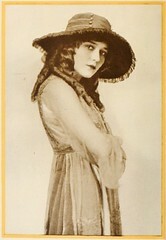 Mary Pickford famously said that she didn’t believe her sister Lottie to be pretty enough for moving pictures. But Smith family obligations came first for the primary Pickford, and the movies quickly became a family affair. Lottie and brother Jack began working at Biograph within weeks of Mary. 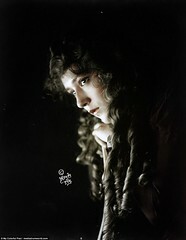 Lottie Pickford appeared mostly in supporting or bit parts in more than two dozen short films for Biograph during 1909 and 1910. In half of those films, sister Mary also played — leads, support or bits. However, in only one film did both sisters play leads — A Gold Necklace, from the summer of 1910, and directed by another newcomer to films, Frank Powell. Powell, like nearly all actors at Biograph, was from the stage. While making the rounds of casting offices along Broadway, D. W. Griffith met and hired Frank Powell, a solid, serious, leading man type and, equally important, a man well-dressed. It was a time when film actors were hired, literally, for the shirts off their backs, or in Powell’s case, his classic three-piece suit — ideal for playing doctors, lawyers or Wall Street wolves. Joining the company just days after Mary Pickford, Frank Powell played the lead in two of the most impressive Biograph films of 1909 — he was the “Wheat King” in A Corner in Wheat, and the physician torn between two dying patients in The Country Doctor. But Biograph and Griffith found Powell’s managerial skills as valuable as his acting. Wanting more time to concentrate on directing dramas, Griffith assigned Powell as director of a second production unit at Biograph — a comedy unit that included Mack Sennett (who would eventually take over the comedy unit, leaving Powell to the secondary dramas), as well as veteran cameraman Arthur Marvin. And of course, Lottie and Jack. Rising fast among the Biograph players, Mary Pickford had proven herself adept at comedy, and was assigned to head the cast of Powell’s directorial debut, All on Account of the Milk, in December 1909 (also featuring 13 year old Blanche Sweet in her first significant role). By the summer of 1910, Powell had directed 17 second unit productions, including 8 in southern California the previous winter (in addition to his duties as de facto general manager of the company’s California excursion). 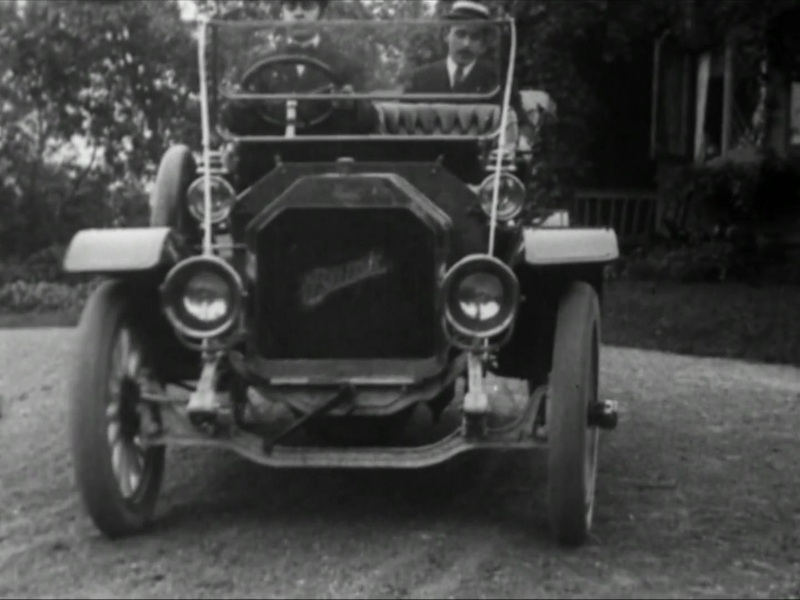 The eighteenth Powell production was shot near Cuddebackville, New York, a scenic upstate hamlet among the Adirondacks that had become the site of an annual working summer vacation for the Biograph troupe. Filmed mostly on location during three days in late August, A Gold Necklace was released on October 6, 1910 at a length of 576 feet, running between 6 and 10 minutes depending on that old bugaboo, projection speed. A Gold Necklace shared a split-reel release with another, shorter Powell comedy, How Hubby Got a Raise (416 feet if you’re obsessive . . . or merely curious). Although technically a second unit production, A Gold Necklace was anchored by a trio of Biograph’s top talent: Kate Bruce, Mack Sennett and Mary Pickford. The twist is provided in the person of Lottie Pickford, playing a rare lead and, for the first and last time, a co-lead with sister Mary. As the fates would have it, they play . . . sisters? No, unfortunately. Just good friends spending lovely, late-summer days at a country resort: Mazie (Mary) with her governess (Kate Bruce), and Nellie (Lottie) with her boyfriend Sam (Mack Sennett), and his obedient driver (Eddie Dillon), the man who handles Sam’s monster Buick. The plot is a classic comedy of errors, although in this case, “a comedy of serious misunderstandings complicated by inexplicable leaps in space and time” better describes the story. This is due in part to the state of disarray of the access copy provided by the Library of Congress. Even when put back into a state of array approximating the original release, issues remain. But we’ll get to all of that soon enough. Mazie, the proud owner of a new (and ostentatious) gold necklace, shows off her acquisition to her governess, a rather nervous woman easily rattled, judging by her reaction as Mazie stomps playfully into the living room. Mazie is soon out the door on her way to meet a friend in the park. In the meantime, a telegram for Mazie is delivered and accepted, nervously, by the governess who exits in near panic to inform Mazie of the telegram. Mazie meets her friend Nellie in the park. After hugs and compliments, Mazie asks Nellie if she would like to wear her new necklace. As Mazie attempts to fasten the piece around Nellie’s neck, they are interrupted by the governess still in full panic mode. The first time through the film, I was ready to conclude that this was the key scene in the whole story. Mazie’s attention is diverted by the appearance of the governess and she never seems to get the necklace clasped securely around Nellie’s neck. Nellie looks down toward her neck and hands, as if she had dropped something. We can’t say for sure who has the necklace because we can’t see the damn thing! Look closely at Nellie’s neck. See that rather wide piece of jewelry there? Me neither, until I slowed it to half-speed and yes, it’s there, barely visible against pale Lottie and her white dress. But it is clear, again when slowed to half-speed, that there is a gap between frames and that Mazie’s expression changes abruptly, as if she is warning her friend to be extra careful with the expensive bauble. This would have been the ideal place for an innovative close-up, or even a clumsy “cut-in” inserted mid-shot showing the object in question (something Griffith had been doing since Betrayed by a Handprint in 1908). But Powell and cameraman Marvin (who also shot “Handprint“) apparently didn’t see the need. But Nellie doesn’t miss the necklace until she mentions it to Sam later as they are strolling through a meadow. As she feels the empty space around her neck, she stops with the sickening realization that she has lost her friend’s gold necklace. After searching the grounds nearby with no luck, Sam jots down a description of the piece, and promises to buy an identical replacement if the original cannot be found. But of all people . . . who should intervene in the chain of events but Mazie’s governess. Normally afraid of her shadow, she decides to comb the grass for . . . oh my! A Gold Necklace!! She recognizes it as Mazie’s, but before she can tuck it away safely where no one would ever dare to look — her bosom — Sam is startled from his slumber and sees her with the jewelry he believes is Nellie’s. She bolts, taking not only the necklace but the hammock, too. Now, whether Sam cared before or not, he’s involved — the governess thinks he’s some creepy interloper who’s harmed Mazie and . . . slept in their hammock! He thinks she’s a thief and a nutcase. The governess returns the necklace to Mazie who promptly leaves to go . . . not to the authorities to report the creepy interloper, as you would expect, but instead to the outdoor cafe for a relaxing cup of whatever. Sam, probably needing a stiff drink after his encounter with the governess, shows up at the cafe and is seated by the waiter in the only empty seat — at a table with Mazie. Naturally he sees her gold chain, one that matches the description given him by Nellie, and startles her when he lunges and points to her neck. Thinking this total stranger a psychopath who means her harm, Mazie, terrified, runs from this open, outdoor, public cafe and numerous potential witnesses, to the isolated woods. A poor choice. Sam charges after her, sending his chair tumbling behind him as cafe patrons simply shrug at the spectacle. Sam quickly catches up. Mazie falls to her knees and starts to plead for mercy, when Sam whips out a fistful of dollar bills, offering to buy her necklace. Having regained at least part of her senses, Mazie figures to placate this madman by accepting the offer. She cautiously makes the exchange — for five one-dollar bills — and runs screaming after Sam tries to thank her. Sam’s smug expression reappears. Mazie runs back into the cottage, fanning herself with Sam’s cash, and drops into a chair, exhausted. Nellie also arrives back at the cottage, but gets no further than the front steps, plunks herself down and cries . . . but pauses to refresh her makeup between sobs. Sam wraps the necklace in a note in an envelope addressed to Nellie, hands it to his faithful driver to deliver (what? now he’s too lazy to hand it to her in person and at least get a nice reward, a hug and kiss from his grateful girlfriend?) But it’s his driver who nearly gets the hug and kiss — which he avoids with considerable agility — from Nellie. An ecstatic Nellie runs into the cottage to return the necklace to a flabbergasted Mazie. Mazie offers to lend the necklace back to Nellie, but Nellie has seen enough of the unlucky piece. She declines the offer with a wave of her hand, leaving Mazie holding the necklace in one hand and the cash in the other and wondering how all this could be happening. Oh, well, c’est la vie! Mazie dons the necklace, glances over her shoulder to see if her governess has crawled out from under the bed, and goes out. She stops for a moment to say hello to a couple of girlfriends (Dorothy Davenport and Jeanie MacPherson) and the local constable (Charles Craig) who just happens to be chatting with the girls. Of course she doesn’t think to mention to the constable the terrifying encounters she and her governess have had with this psychotic creature roaming the countryside, and goes merrily on her way. Sam, believing all to be well, is back at the cottage with his driver and the Buick, when he spies Mazie — with that damn necklace again. He gestures angrily, indicating that he gave her five bills for the necklace, and accuses her of stealing it from the rightful owner, Nellie. Sam runs to get the authorities involved, and Mazie, equally agitated, runs in the opposite direction. But Sam’s driver, having witnessed the scene, takes a moment to process the chaos and decides to pursue Mazie. When she stops to sit and rest and contemplate the jinxed jewelry, he snatches it from her hand . Mazie finds the constable. Sam is handed the necklace by his driver who gestures to Sam that he wants no more involvement in this shady business. Sam gives the necklace to Nellie just as the constable arrives. Before he can arrest both, the remaining principal characters convene on the site, miraculously. Nellie explains the necklace was a loan from her friend Mazie, that she lost it when it slipped off her neck and that no one is a thief. Or a psychotic interloper. And all is reconciled. A few notes on the performances, and construction/reconstruction of the film. A comedy of errors, particularly one centered on an inanimate object handled (or mishandled) at one point or another by every principal character, is bound to have a significant physical element to it. A Gold Necklace, being both silent and not relying upon dialogue intertitles, could be expected to have a lot of basic pantomime and gestural histrionics to “put the story across,” as they would have said in 1910. Surprisingly, there is not an excessive amount of either mime or gesture. The most prominent example of pantomime (with occasional added gesture) is one performed by nearly all of the principal characters beginning with Nellie when she first realizes the necklace is missing from her neck. 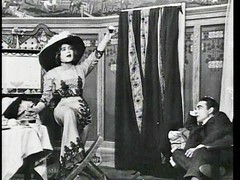 Mary Pickford alternates between “straight” and comedic (unlike “Oh, Uncle!” where she was 100% the straight character). The golden chain that literally passes through her hands a half dozen times in the film gives her a nice opportunity to show one of her strong suits as an actor — bits of character “business” with a personal object (think The New York Hat or The Broken Locket). A Gold Necklace also gives Pickford ample time for comic turns, most apparent in her reactions, and especially in those scenes where she goes toe to toe with future “King of Comedy,” Mack Sennett. The story progresses at a fast pace, no scene is much longer than 30 seconds. Director Powell doesn’t rely upon sophisticated editing schemes involving switchbacks or breaking up time and space in individual scenes. However, as noted earlier, in at least one critical scene a cut-in to the necklace could have added clarity to circumstances of its initial loss. The online viewing print also has only one intertitle, but there are a half-dozen instances of frame loss during scenes, resulting in jumps that could indicate the original placement of explanatory intertitles. Although such placement was uncommon in 1910, here we are dealing with a director other than Griffith. One imagines that Griffith retained oversight even on projects he did not personally direct, but given that the work load already necessitated the formation of a second production unit, maybe that oversight was not always possible, or was occasionally absent. There are a lot of discrete camera set-ups — I count eleven, and twenty-four scenes — for a split-reel comedy. And one camera set-up is used for a third of those scenes, a static interior, the living room of the cottage. (We are never sure what or where this building really is — two exterior shots show what I think is the Caudebec Inn, the rustic hotel that housed the Biograph troupe during their work at Cuddebackville.) That leaves 10 set-ups for the remaining 15 or 16 scenes, all outdoors. Maybe director Powell got a little carried away with the scenic beauty of upstate New York during location shooting. When I saw the chaotic state of the LOC viewing print online, and the number of cuts, I thought a logical reassembly would be more difficult than it actually proved to be. With a bit of organization, and numbered labels for each scene on a paper notepad as a rudimentary “storyboard” (you’ll find a digital version in the Appendices at the end of the article), the pieces of the puzzle fell into place quite readily. The only really questionable sequence, the one that seemed out of place with all the others, was the “telegram delivery” scene, and Mazie’s receipt of the telegram. Typically, such a scene would be used to create tension or play some key role in plot development. It was difficult for me to see how or where such a dramatic scene would fit within the simple comic tale of a lost necklace. 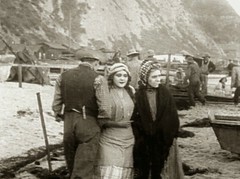 It took a bit of time before I realized that the only purpose of the telegram scene was to set up the scene that would logically follow — in which Mazie is distracted by her governess pleading for her to return to the cottage for the telegram, which in turn results in her apparent failure to securely fasten the necklace on Nellie. That was a lot of footage (and badly over-emoted by the usually reliable Kate Bruce) just to set up that scene, and it really doesn’t serve its purpose very effectively. It’s not precisely clear how, where and when the necklace was lost until the governess finds it when she crawls on the grass beneath the hammock holding a slumbering Sam. And finally a few notes on cast identification. The Library of Congress website lists actors and crew members for A Gold Necklace. Several of those are almost certainly incorrect. Florence LaBadie and Violet Mersereau are almost certainly not identifiable in A Gold Necklace, contrary to the cast list on the LOC website. In the only two scenes where individuals other than the principal actors are present — the scene in the outdoor cafe and the scene on the cottage steps where Mazie stops to say hello to the constable and two female friends — three actors in “bit”parts have been positively identified. They are Dell Henderson, seated in the background at a table in the outdoor cafe and, as the two female friends on the steps, Dorothy Davenport (below at left) and Jeanie MacPherson (at right). These actors were identified by a consensus of committees of film scholars who spent years researching Biograph company records and filmmakers’ notes, aided by meticulous frame-by-frame study of the films and photographs of all actors who had worked for Biograph according to company records, as well as those who claimed to have appeared in the films, but of whom there were no official company records. Their findings have been published in “D. W. Griffith and the Biograph Company” (1985, see Bibliography for citation), and in the 12-volume “The Griffith Project” (BFI, 1999-2008). These identifications were not made casually and were only finalized upon full agreement of the participants. If they were confident, but not absolutely certain of the identity of a cast member, the name was included with a question mark next to it. If not confident of the identity, only a question mark was placed next to the name of the character or group of characters, not the name of an actor. Assigning film credits, treating them as fact, and publishing them, whether in print or online, should not be done without a high standard of proof. IMDb or Wikipedia — ad hoc conglomerations of user-submitted factoids — are useless for accurate early cinema filmography information, unless they cite information derived from primary sources (which supposedly, but not in reality, is the Wikipedia standard for citations; IMDb has none of which I am aware). Given their nature and their standards, they are what they are. However, I expect better from institutions entrusted to house and protect and provide opportunity for the study of our cultural heritage. For an important public institution such as the Library of Congress to publish and therefore give weight and status as fact to information that is based upon no more than myth, rumor or even educated guesswork by an individual, is not acceptable. Of course staffing and money are always issues. But question marks and notations indicating a lack of consensus on a piece of information are not costly. A Gold Necklace is available in streaming HD video at the Library of Congress National Screening Room, and also at the LOC’s National Screening Room playlist on YouTube. This particular source is an MPEG4 digital video copy of an out-of-sequence “access copy” or “viewing copy” originally made for public study and research at the LOC facilities in Washington, DC. As in my essay on ” Oh, Uncle!”, I attempted to reassemble this LOC viewing copy of A Gold Necklace into a coherent film. Unlike “Oh, Uncle!”, in which the shots were simply assembled in reverse order, A Gold Necklace had no semblance of continuity, forward or reverse. (The only pattern distinguishable was that some scenes with identical camera set-ups were placed together, without regard to narrative logic). But why such chaos in what should be an accurate example for study and further research? The answer is both long and complicated. Here’s the short version. There has never been a single, coordinated effort to preserve comprehensively and coherently the Mary Pickford Biographs. Numerous efforts over many decades — the 1950s, 60s, 70s and 90s — were made by a variety of institutions — the LOC, MoMA, the AFI, UCLA — to preserve for restoration the many film elements held by archives and individuals, including Mary Pickford who actively sought their preservation for over forty years, and the institution she created, the Mary Pickford Foundation. Pickford’s personal collection included the original camera negatives for about 75 Biograph titles that she had acquired in the mid-1920s. It was her will upon her death in 1979 that these films be preserved for posterity by the LOC. But efforts made in good faith over the decades have given posterity a very mixed bag of results. Lack of resources — money and human — and lack of coordination of efforts are largely to blame. Also, a lack of knowledge of what was contained in the various surviving elements of the Pickford Biographs resulted in the preservation of some, but not others. 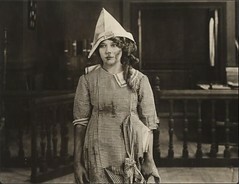 When the LOC copied their original collection of 35mm Biograph paper prints onto 16mm safety film (an example of insufficient funding dictating format), they chose to not copy those paper print Pickford titles that were also contained in her personal collection that she had donated to the Library of Congress. Thus, where duplicate titles existed, the LOC copied only Pickford’s original camera negatives of those titles. Sounds logical, doesn’t it? The problem was the camera negatives were largely without intertitles and were often out of sequence, making restoration difficult, or even impossible without more information. This could explain the state of the LOC viewing copies of both “Oh, Uncle!”and A Gold Necklace. Preservation is only the first step toward restoration. Restoration requires something as close as possible to a recreation of the original object. For many if not all of the films, the information — in the form of other copies, documents and film elements — is out there, and mainly held institutionally. Efforts at restoration need coordination — they need a plan (and of course, money). In the late 1990s, film scholar Christel Schmidt began a survey of Pickford materials in U.S. archives, including the largest holder of Pickford Biographs, the Library of Congress. Out of that survey, concluded in the mid 2000s, Schmidt produced a report that gave not only a comprehensive accounting of the whereabouts and state of those materials, but also presented an action plan for their preservation and restoration. Far too much time has already elapsed without significant progress on the implementation of that plan. Is this release of materials on the internet via streaming video a tentative step in that direction? Though I’m glad for what there is, I won’t be convinced without more. If it is a question of funding, say so. Let’s have that “conversation.” And more. Much more. On the LOC website and YouTube LOC Nat’l Screening Room Playlist . The source files are identical. And . . . two “Storyboards” — one (Appendix A) showing the chaotic structure of the LOC viewing copy; and one (Appendix B) showing the structure of my re-edited version. Appendix A shows the out-of-order scenes numbered in sequence 1 through 25, as they occurred in the LOC version. In Appendix B you can follow those numbered scenes to see where each was moved and inserted in my reassembly of the film. Click on any of the thumbnails for a slideshow of the images. Each image represents one scene or “cut” in the film. All scenes in the film are represented. 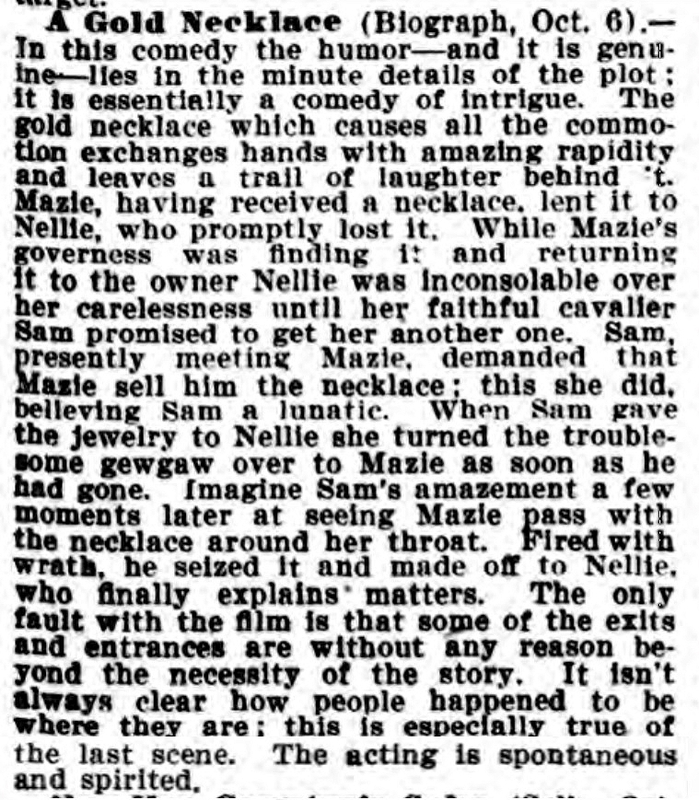 Review of “A Gold Necklace,” The New York Dramatic Mirror, Oct. 12, 1910.
Review, “A Gold Necklace,” The Moving Picture World, Oct. 22, 1910. 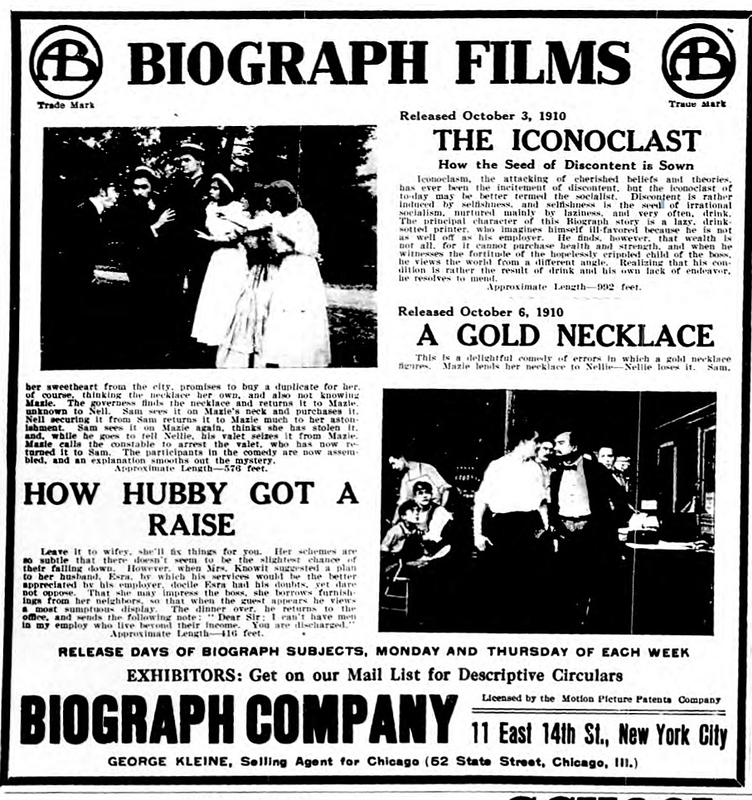 Biograph Ad, “A Gold Necklace” from The New York Dramatic Mirror, Oct. 5, 1910. New York NY Dramatic Mirror, 1910 Sep – Dec 1911 (Archives of The New York Dramatic Mirror at fultonhistory.com), for The New York Dramatic Mirror: Review, A Gold Necklace, October 12, 1910, p. 31, and Biograph advertisement, October 5, 1910.
Cooper C. Graham, Stephen Higgins, Elaine Mancini, Joáo Luiz Vieira, “D. W. Griffith and the Biograph Company (Filmmakers, No. 10),” The Scarecrow Press, 1985, for cast and credits, “A GOLD NECKLACE,” p.92; for Frank Powell director credits, pp. 70 ~111. For actor and crew identification methodology, see pp. 5-11. Tom Gunning, “D. W. Griffith and the Origins of American Narrative Film, The Years at Biograph,” University of Illinois Press, 1991, 1994; pp. 54-55, note 43, referring to Frank Powell and directorial credits in Biograph company records for 1909-10. Autoweek.com, John F. Katz, “1909 Buick Model F: Driving David D.’s Original Design,” July 2, 2006.